Brand New One Bedroom Guest House on Mt. Crested Butte and only 100 yards to the Homeowner's Trail! Luxury Mountain Cabin is an extravagant location to spend a romantic getaway with someone special. This BRAND NEW guest home features high end finishes, two decks, a wood burning fireplace, deep soaking tub and steam shower. 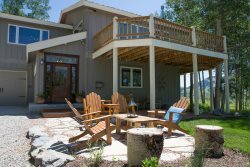 It is conveniently located 1.7 miles (5 minute drive) to the Crested Butte Mountain Resort and 100 yards to where you can access the ski run, Homeowner's Trail which, will take you to the Gold Link Lift. The state-of-the-art kitchen and living room are perfect for a romantic evening of cooking and relaxing in the privacy of your own home. The deck off the living space with outdoor seating provides the perfect setting for a candle lit dinner, bathrobe coffee and breakfast, or cocktail hour. Set the mood with your favorite music from the SONOS sound bar, with separate sound in the living space and bedroom for added ambience. Then take in your own private views of Oh Be Joyful, Scarps Ridge, Snodgrass, Smith Hill & Meridian Lake. A second deck off the master suite shares these amazing views, but the interior is just as breathtaking. Imagine relaxing in this glamorous deep soaking tub after a full day of adventures, then slipping into the extravagant king size bed made with fine linens and waking up feeling pampered. Let this be the place that holds your precious memories... year after year. It can be booked by itself or with the main home, Elk Run, for groups as large as ten. Are you visiting Crested Butte for a wedding? This property is unique in that the Bride and Groom can stay in the private guest house and other family members can stay in the main house. Very helpful and patient, especially when steering us in in the dark with Google Maps misleading us. A great time overall. Hope we can return soon.